Two Southern Californians picked up wins over higher seeds today in the third round of the ITF Grade 1 International Spring Championships, with Jacob Bullard of Calabasas and Jenna DeFalco of Tustin outlasting No. 3 seed Tyler Zink and No. 4 seed Charlotte Chavatipon. Bullard, the No. 15 seed, led Zink 7-6(3), 5-2, but was pushed to a third set when Zink won five consecutive games, while saving a match point on a cool and mostly cloudy day at the Dignity Health Sports Park in Carson. Serving for the match at 5-3 in the second set, Bullard's forehand went awry, while Zink was able to use his forehand effectively to force errors from Bullard, including at 30-40. Bullard earned his first match point with Zink serving at 4-5, but Zink saved it with a good first serve and won the next two points, one in a riveting long rally and another with a third shot forehand winner after an excellent first serve. Bullard was broken in the next game when he missed a forehand volley, and he received a point penalty for an audible obscenity, meaning Zink had to win only three points to take the set, which he did. Bullard went up 5-2 in the third set, and rather than dwell on a similar lost lead in the previous set, he instead focused on the quality of his play throughout the match. "The whole time I thought I was the better player today," said the 18-year-old left-hander, who will be joining the Texas Longhorns in the fall. "He competed really hard, he did some things well, went for his shots, had some good points down the stretch in the second set, and it kind of got away from me at the end. But definitely in the third, I was still confident in my game, and thought maybe just get through my first few service games, regroup, and my level was back to where I thought it could be. I played well on the big points and played smart and I thought that paid off for sure." At 3-2 in the third, after he held, Bullard called for his longtime coach, Gerald Mathews, to come to the court. "We had a game plan going in, and he basically told me I'm going to need to be the aggressor to win the match," Bullard said. "It was whoever was going to be able to dictate down the stretch was going to win. He stressed using my forehand from the middle of the court....and just continuing to make first serves." Bullard broke Zink immediately after that conversation, and held for 5-2. 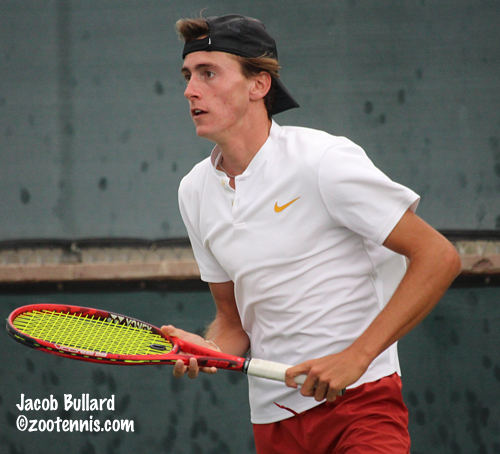 Zink, looking discouraged, went down 0-40, but saved two more match points, before Bullard finally converted on the fourth, hitting a backhand winner to secure the 7-6(3), 5-7, 6-2 victory. Bullard will play fellow left-hander Andrew Dale, the No. 12 seed, in Friday's quarterfinals. Dale beat unseeded Welsh Hotard 6-3, 6-4. Top seed Liam Draxl of Canada beat No. 13 seed Ronan Jachuck 6-1, 6-1 in under an hour, and will face No. 5 seed Toby Kodat, who defeated unseeded Derrick Chen of Great Britain 6-2, 6-2. The only seed remaining in the bottom half of the draw is No. 8 Blu Baker of Great Britain, who took out wild card Aditya Gupta 7-5, 6-2. Baker's quarterfinal opponent is unseeded Stefan Dostanic, who defeated Stefan Leustian 6-3, 6-2. Wild card Zachary Svajda has lost only one game in his last two matches, beating Leighton Allen 6-1, 6-0 this afternoon. He will play unseeded Marcus McDaniel, who beat wild card Ishaan Ravichander 6-2, 6-3. None of the boys quarterfinalists have any head-to-head results in ITF Junior Circuit competition. As with the boys, five seeds remain in the girls draw, including the top seed. Hurricane Tyra Black, the defending champion, beat qualifier Victoria Hu 6-2, 6-0 and will face No. 12 seed Emma Jackson, who beat wild card Zoe Howard 6-2, 4-6, 6-2. Jackson defeated Black last week in the third round of the Easter Bowl. Unseeded Katrina Scott, who beat No. 3 seed Abigail Forbes in the first round, cruised past No. 15 seed Alexandra Yepifanova 6-1, 6-2 and will meet No. 7 seed Linda Fruhvirtova of the Czech Republic. Fruhvirtova ended the run of lucky loser Gianna Pielet with a 6-4, 6-3 win. No. 8 seed Lauren Anzalotta of Puerto Rico beat No. 11 seed Gabby Price 6-4, 7-5 and will play No. 13 seed Robin Montgomery in the quarterfinals. Montgomery defeated fellow 14-year-old Nikita Vishwase 7-5, 6-4. 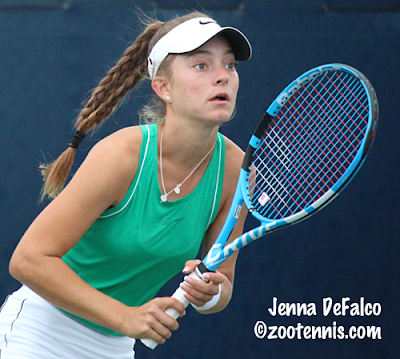 Sixteen-year-olds DeFalco and Chavatipon already have quite a rivalry going, with today's meeting their third in 2019 at the ITF Grade 1 level. After splitting their meetings in Costa Rica and Colombia, DeFalco now has the edge after coming back for a 3-6, 6-2, 6-4 victory. "The first set I was making a lot of errors, and I was going for so much, DeFalco said. "So I was telling myself just to stay back and make more balls and wait for the right opportunity." "When I played her before and I won, I played pretty good and I was really controlling the court," DeFalco said. "I made her miss a lot. When I played her again recently and lost, I was making a ton of errors, so today I knew I had to make more balls." DeFalco, who reached the third round of last week's Easter Bowl, losing to eventual champion Emma Navarro, had a goal of reaching the quarterfinals this week, but agreed she now has to reset her goals. DeFalco's quarterfinal opponent will be wild card Connie Ma, who defeated Elvina Kalieva 6-1, 6-3. "She makes a lot of balls, so I'm going to have to be patient against her," DeFalco said. "If I play my game, I think I'll be fine." The doubles semifinals are set for Friday, with boys top seeds Martin Damm and Toby Kodat taking on unseeded Jacob Bullard and Stefan Dostanic. Unseeded Braeden Ho and Welsh Hotard will face No. 6 seeds Blaise Bicknell and Ronan Jachuck, who beat Easter Bowl champions Tyler Zink and Will Grant, the No. 2 seeds, 6-4, 7-6(4). Unseeded Holly Fischer of Great Britain and Skyler Grishuk will play No. 8 seeds Jenna DeFalco and Ellie Coleman in the girls top half semifinal, while No. 4 seeds Savannah Broadus and Vanessa Ong will play unseeded Kacie Harvey and Natasha Subhash in the bottom half semifinal. The semifinal in 16s singles will be played Friday, with the two remaining seeds playing each other in one semifinal. No. 6 seed Ria Bhakta will play No. 7 seed and defending champion Anne Lutkemeyer. In the top half semifinal, Makenna Martinez will play Winta Woldeab. All semifinalists in the boys 16s draw are unseeded. Eli Gordon will play William Cooksey and Alexander Chang will play Jiaxi Ma of China for a spot in Saturday's final. Complete results and Friday's order of play can be found at the tournament website.